A few weeks ago, I got an event invitation on Facebook: pop-up farmers market stand, in a couple of days, out in front of a local dance studio. The host was my friend Madeline, who I knew from her time as a grad student in my department, but who’s now living a couple hours south, building a house and growing vegetables at Castle’s Ridge Farmstead down near the Ohio River. The dance studio was en route home, and I hadn’t seen Madeline in literal years, and I love vegetables, obviously, so why not? And seeing Madeline was great and the vegetables were lovely. But as I was leaving, she said “do you want to take a couple more zucchini? Because we were on vacation the last week, so we didn’t harvest, and these guys are just… really big. And I’d prefer they go to someone who’ll eat them instead of getting composted.” So I ended up with four zucchini. And to be clear, these were not dainty little banana-sized courgettes, but big, ribbed 3-pounders that strained the shopping bag they were in and tried to dislocate my shoulder on the half-mile walk home. So obviously I was going to make zucchini bread. 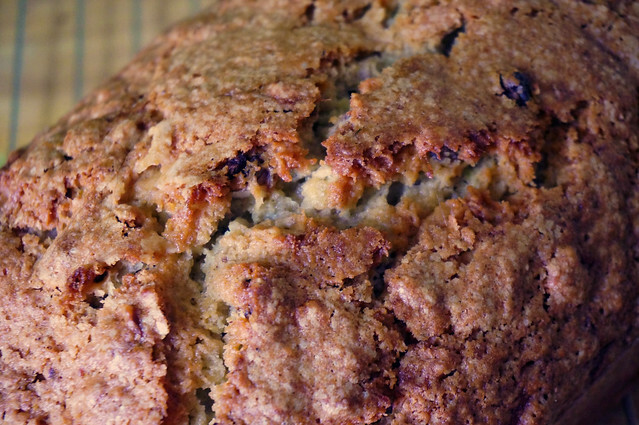 Maybe not obvious to you, but definitely obvious to me — I love zucchini bread! 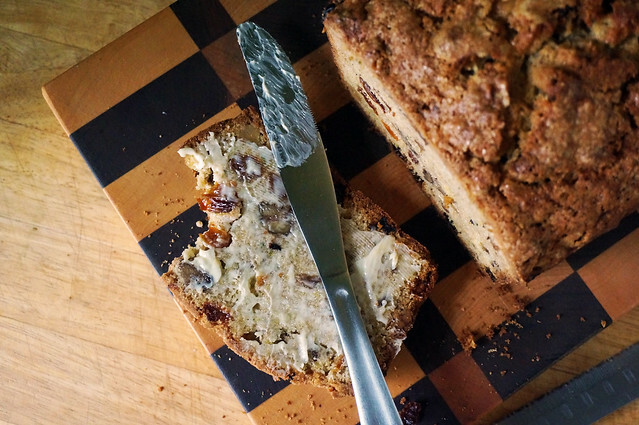 A spiced quick bread with a scattering of nuts? Always on my good list. I don’t, however, have a standard recipe: nothing passed down from a parent or grandparent, no well-loved recipe card gotten from a family friend. 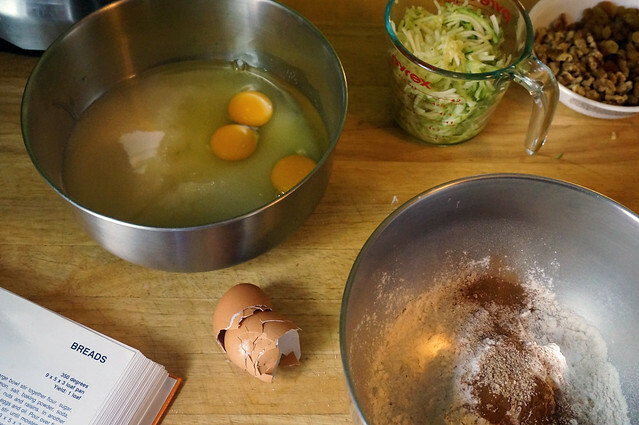 Every time I make zucchini bread I just crack open the nearest cookbook and run with it. This time I chose La Piñata, the cookbook of the Junior League of McAllen, Texas, first published in 1976. I didn’t look too closely at the recipe before I embarked on it, because zucchini bread recipes are pretty much all the same. This one had raisins, I noticed, which is a little unusual, but I like raisins well enough, so I was willing to go with it. But then as I continued adding ingredients I started to look askance at the page, like, what are Mrs. Morgan Talbot (Jane) and Mrs. Joe Friend (Pam) doin’ down there in McAllen in 1976? Two cups of zucchini. A cup of nuts. Another cup of raisins. All in a single loaf pan! It cooks for 90 minutes! As I posted to friends on Facebook, “This is the fruitcake of zucchini breads. It will either be amazing or a disaster.” My friends were terribly invested in the outcome, by the way. It’s why I’m finally back here out of hiatus — they made me promise to blog it if came out. And come out it did. I was right: this is a fruitcake masquerading as a zucchini bread, and it is a delight. With a typical zucchini bread I might eat two or three good slices at a sitting, pretending it’s a healthy snack because of all the squash. But this bread? It’s a doozy. The loaf weighs three pounds! If I eat one not-very-thick slice I’m fueled for a whole morning — so in addition to being fruitcake in disguise, it might also be trail food. But most importantly, it’s delicious. Adapted from “Zucchini Bread” by Mrs. Morgan Talbot (Jane) and Mrs. Joe Friend (Pam), in La Piñata, the cookbook of the Junior League of McAllen, Texas. Preheat the oven to 350°F, and grease and flour a loaf pan. In a large bowl, combine the flour, cinnamon, salt, baking powder, and baking soda. Add in the zucchini, walnuts, and raisins, and toss to combine. You may need to use your fingers to separate out big clumps of zucchini — you don’t need each strand separate, but try to distribute it evenly. In another bowl, whisk together the eggs, sugar, and oil, then pour the egg mixture over the flour mixture. Stir together until no dry flour is visible. This is a very thick batter, and though it may take a little elbow grease, you likely won’t need any more liquid. 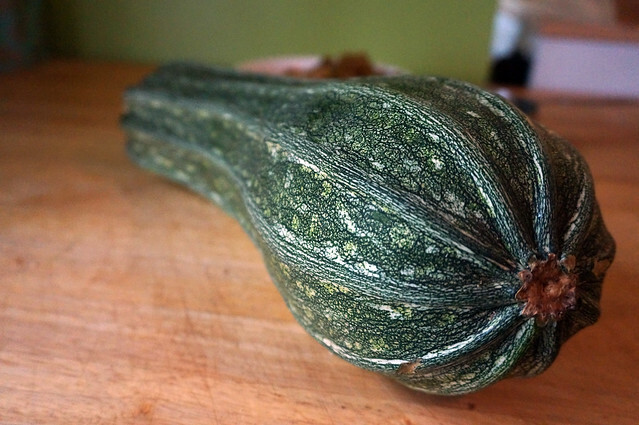 If, however, you can’t get all the flour moistened (perhaps you had old, dry zucchini?) add water a tablespoon at a time until the batter comes together. Scrape into the prepared loaf pan and bake in the middle of the oven for 90 minutes, or until a pick inserted into the middle of the loaf comes out clean. Let cool in the pan for 10 minutes, then run a knife around the edge to loosen, remove from pan, and let cool on a wire rack. Ideally the loaf should cool completely before slicing, but try to give it at least a couple hours minimum; it’s a very dense loaf and needs the time to set. Shredding zucchini: I used a food processor, which makes very quick work of the task, but you could also use a grater (large holed, not a zester or microplaner). This has a very simple spicing; in fact, the recipe I’m adapting has only cinnamon, but I couldn’t resist a touch of nutmeg. You could definitely go further and make this into almost a spice loaf with additions of clove, allspice, cardamom, etc., to your taste. Ditto to vanilla, rum, or citrus extracts. (Or for that matter, just a nice dark rum.) I’d suggest trying about a teaspoon of an extract, or a tablespoon of rum. 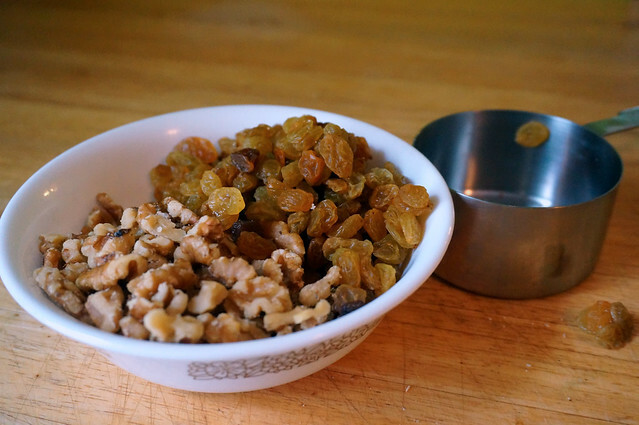 Raisin haters rejoice (even in your wrongness): the nuts and fruits can be swapped out pretty much ad libitum, but to keep the dense, fruit-and-nut feel I’d try to keep it about 2 c total, and I’d definitely keep some form of dried fruit in there. Great one! Thank you so much! Hip hip, huzzah! This is just the loaf I have been waiting for. I *need* to make this bread. It is calling to me. I am not so rude as to ignore the call.